DETROIT, MI–Head women’s basketball coach Tony Hitchcock has been busy this offseason recruiting quality student-athletes for his 2009-2010 squad. He has been successful thus far and continued the trend on Friday when he signed Muskegon Community College transfer Santrea Bush. Bush, a 5’6″ junior college transfer, will make Marygrove her home for the next two years. Before heading to junior college, Bush was successful on and off the court for Orchard View High School (Muskegon County). She was prominent member in her community as she served as class president and a member of the National Honor Society. On the court, Bush was awarded All-Conference second team, All-Area and Honorable Mention. The hardworking team captain also led her team to a district championship her junior year. Her four years of standout work in the classroom and on the court was only the tip of the iceberg for Bush. She is well-known for giving back and most recently completed a missionary trip in Puebla Puebla, Mexico. 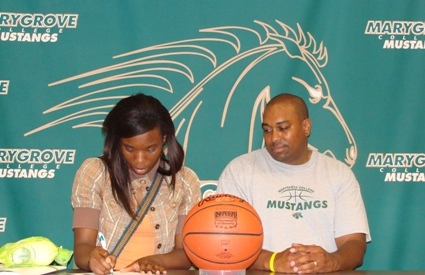 Her experience and leadership will be a valuable asset for the Mustangs for years to come. Coach Hitchcock on Bush: Santrea is a highly skilled player with an above average basketball IQ. She will make an impact in the paint with some much needed scoring and rebounding. Above all else, Santrea is a remarkable young lady that gives to others. She is very involved in volunteer work and just finished a stint in Mexico on a missionary trip. We are excited to have Santrea in our program and a part of the Mustang family.